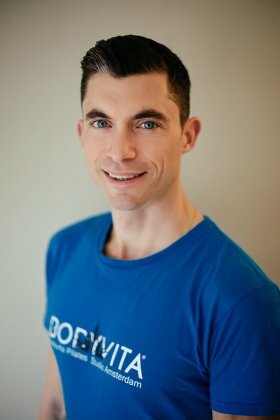 In our studio in the center of Amsterdam Bodyvita has a team of several professional Pilates instructors at your service. Out trainers have different backgrounds and approaches, yet all share an extensive knowledge and experience in lifestyle counseling and health management. Before Rosi Soto was convinced by the advantage of Pilates, she was devoted to her career as a professional ballet dancer. After following professional dancing classes in Spain and at the San Francisco Ballet School, Rosie eventually gained a degree at the Royal Conservatory of Madrid. Her dancing career then took her to the United States, the UK and eventually into the Dutch National Ballet Team. After she helped recover from a serious knee injury by means of Pilates training, she decided to specialize in teaching others the same methods that helped her regain her strength. As a certified primary school teacher and personal trainer, teaching is the main passion for Andrea. 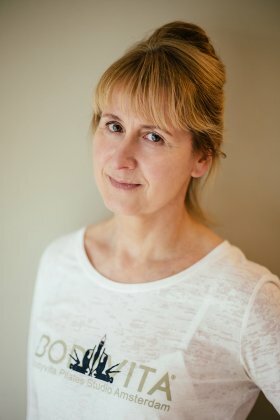 With a strong personal commitment to the development of her students, as well as a keen perception on when special attention is required, Andrea is the right trainer to stimulate your development at your own pace. Physical exercise plays a large part in her daily routine, giving her the natural enthusiasm that convinces others to do the same. Monique settled in Amsterdam for her studies in human movement sciences and ergonomics. From there on she specialized in physiotherapy and gained years of experience with rehabilitation exercises. Yet it was her own passion as a dancer and gymnastic that lead to her wish of becoming a trainer herself. Today, she has been employed by a large number of gymns and has helped with the development of an impressive variety of physical health and training programs. After witnessing the impressive results of Pilates training, she adopted this new specialty. It lead to the training and coaching of many different groups, from professional dancers to acrobats and other Cirque Du Soleil artists. From her early ages wanted to help people to look better physically and stay healthy. She decided to learn human anatomy, physiology and biochemistry of human body processes more precisely. is idealy designed for individuals, that are looking to improve their physical and inner health without having to perform a high intensity exersize type.She likes to work with individuals and groups to provide high quality professional training programs. Admiring of body perfectionizm, symetry and proportions she continue to practise bodybuilding and study sports nutrition dietry.Her formula is to help people understand, that basic principles of healthy balanced diet and combination of sport activities can endure life. As a little girl her mum took her to ballet class. There began her love for movement and fascination for the human body. Madeleine went to the local ballet school and enjoyed performing in the school presentations.After her ballet training, which she attended at the Conservatory of Brabant as a dancer and studied to become a ballet teacher at the Conservatory of Rotterdam, Madeleine danced with the International Dance theatre in Amsterdam. Over 25 years she enjoyed teaching in her ballet school The Dance Corner and supported the top of the ice-skaters of the KNSB. When this career came to an end, Pilates became her new passion. First in therapy and later as a certificated Pilates Mat teacher. 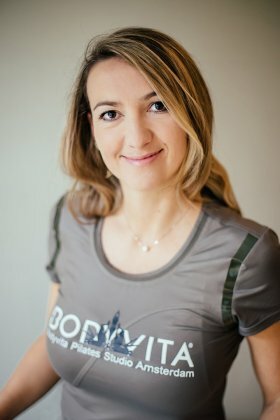 She is convinced that this method brings you the result of using your body in a most satisfactory way.Currently she is teaching at several gyms and Pilates studios in Amsterdam and accomplish the Polestar Pilates Studio education.Central to her classes are efficiency, simplicity and effectiveness in how to perform the exercises. Within using conscious breathing it makes the training easier, lighter and joyful while you are strengthening your muscles in a flow. She aims to point you in the right direction to trust yourself in balancing your body and your mind. Stefania moved in Amsterdam in 2013 to open up further her horizon and expand her knowledge. She studied in Greece Dance in the professional dance school “Niki Kontaxaki-Bakali ” and finished her studies in Chemical Engineering of the National Technical University of Athens in 2012. In Greece she worked as ballet and contemporary dance teacher to kids and adults. Moving in Amsterdam introduced Stefania the Pilates method. After experiencing the benefits of Pilates, decided to follow the Polestar Pilates and nowadays she is a certified Polestar Pilates Trainer in Mat and Studio Education. Imagination, fun and coordination are the highlights of her teaching. Stefania is developing dance and art as a free-lancer, keeps on in exploring and educating herself through out disciplines of somatic practices and manual practices. “Through moving and exercising, together we will create an hour of mindful movement where body and mind can work in balance leading to better posture and more strength”. Stefania has been teaching dance since 2007 and Pilates since 2014 in several studios and gyms.